Enjoy a comfortable 2hour cruise on the calm inland waters of the Gold Coast Broadwater while savouring a selection of delicious cakes, pastries, hot and cold drinks. while savouring a selection of delicious cakes, pastries, hot and cold drinks. incredible homes, hotels and restaurants that adorn the canals and foreshores. impress and amaze you in its diversity and tranquillity. We are happy to cater for food allergies and all platters are prepared and presented with strict adherence to Food Safety Regulations. See the Gold Coast at its best on this afternoon adventure. The warmth of the sun and the breeze on the water make for a perfect combination with which to see the wonderful Gold Coast scenery. cold beer and soft drinks. Quite the way to spend an afternoon on the water. protected to preserve the eco-systems. other activities and ideas of things to do in South East Queensland. Depart on a magical 2.5hour sail/cruise which will take in the fantastic sights of the Gold coast and its surrounding islands. Enjoy a decedent lunch on board our beautiful luxury sailing vessel. Depart on a magical 2.5hour sail/cruise which will take in the fantastic sights of the Gold coast and its surrounding islands. A short pleasant sail will take us past magnificent homes and mansions that line the shores and canals of the Gold Coast. Weather pending we will drop anchor in a picturesque spot where you and your partner, friend or small group can indulge in a specially prepared lunch and chilled drinks. You can select your lunch from 2 options and we are happy to tailor the food based on special dietary requirements. The Premium lunch comprises a beautiful selection of gourmet wraps, fresh tropical fruits, a variety of tasty cheeses and crackers. A further option is the Luxury package featuring a selection of local fresh seafood, cold meats and gourmet salads. To complete the meal there are juicy tropical fruits and a range of cheeses and crackers. Enjoy your lunch with chilled liquid refreshments including fine champagne, wine and soft drinks. After lunch we will set sail for the final part of our cruise around the Gold Coast Broadwater. 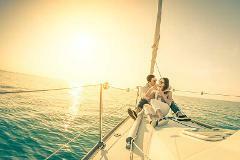 All you need to do is to sit back and enjoy the relaxation and tranquillity of sailing as we make our way home. There is no better way to take in the beauty and magic of the Gold Coast than a sail/cruise on the Broadwater as the sun is setting. Whether you are seeking the ultimate romantic experience or just want to chill out and relax. experience or just want to chill out and relax, this cruise provides it all. and galley below, our yacht is certain to impress. dotting the shores and the abundance of islands, canals and diverse wildlife. tropical fruit, tasty cheeses and crackers. lasting memory of your time in South East Queensland.